She may not have won an award last night but she definitely won my award for Best Dressed. Lizzy looked absolutely amazing. Beautiful. Dramatic. The perfect dress to make a statement. Now the awards season has officially begun. Everybody, please welcome the 66th Primetime Emmy Awards! I love this time of the year. Even though it came roughly about a month early and on a Monday. But who cares. It's the Emmys! Hosted by Seth Meyers, who did a serviceable job, the show awarded trophies to some of my favorites like Ty Burrell, Allison Janney, Modern Family, Joe Morton, Uzo Aduba (Naija stand up! Igbo kwenu! ), etc. But at the end of the night, it truly became a send-off party for Breaking Bad. The critically acclaimed drama series walked away with a multitude of awards including Best Actor for Bryan Cranston, Best Supporting Actress for Anna Gunn, Best Supporting Actor for Aaron Paul, and the biggest award of the night, Best Drama Series. 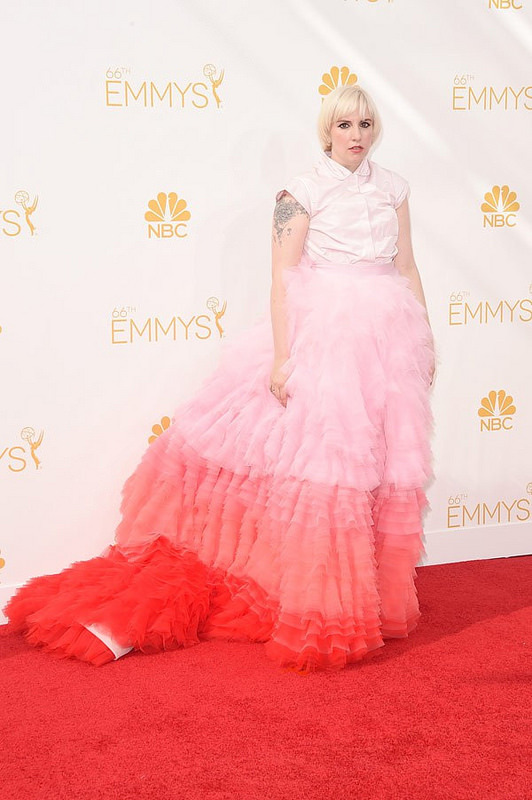 With that out of the way, let's get into some red carpet fashion shenanigans. This is the best I've ever seen Kaley on any red carpet. The pink and red combo works great against her skin. 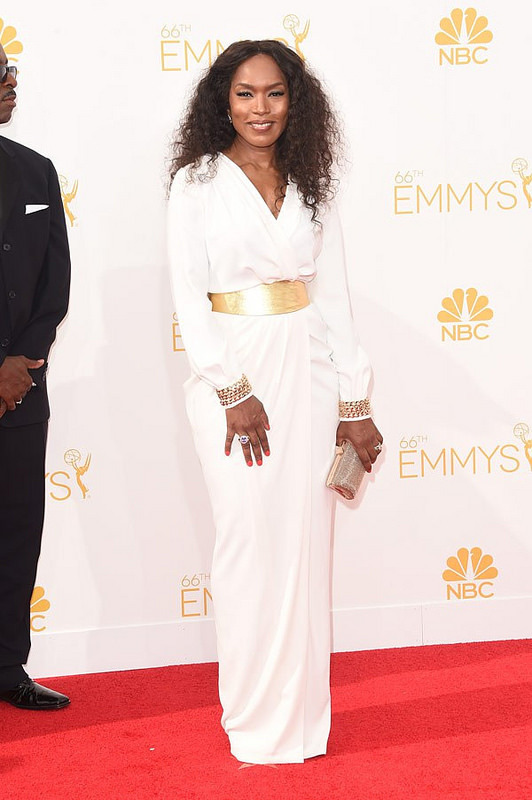 The hair could be bit better, the clutch a different color (black), some jewelry placement here and there. But I would take this look over any other look of hers I've seen on the red carpet any damn day. She looks nice. Getting a 70s vibe but in a good way. And, no. Your eyes are not playing tricks on you. Great navy blue color. Dress fits her like a charm. A statement jewelry was needed somewhere. I wanna age like her when I grow up. I'm really loving this dress. ...it just suits her so well. Love the flirty, girly hem. Keeping the Orange is the New Black train moving along are the lovely ladies above. Danielle's dress is not working for her. At all. Great color against her skin but that's about it. And no to the hair. Lauren also chose a nice color to complement her fair skin. But the dress is complete fug. No other way around it. Laverne looks very pretty. Great bodice, questionable train, and a smidgen too tight. The only thing she got right was the makeup and hair. The design of the dress is wonky and the color is doing her no favors. This is a very interesting dress. The more I look at it, the more I like it. Yeah, I'm liking the dress. Judging by the original design of the dress (here), she should have kept the sleeves long, got a shirt that was actually in her size, and maybe have chosen darker colors for the tiered portion of the skirt. I don't mind the platinum blonde shade but the cut of the hair isn't working. And can the Academy please stop rewarding her with a nomination for Best Actress in a Comedy? She's not even the best actress on her own show. Geez. 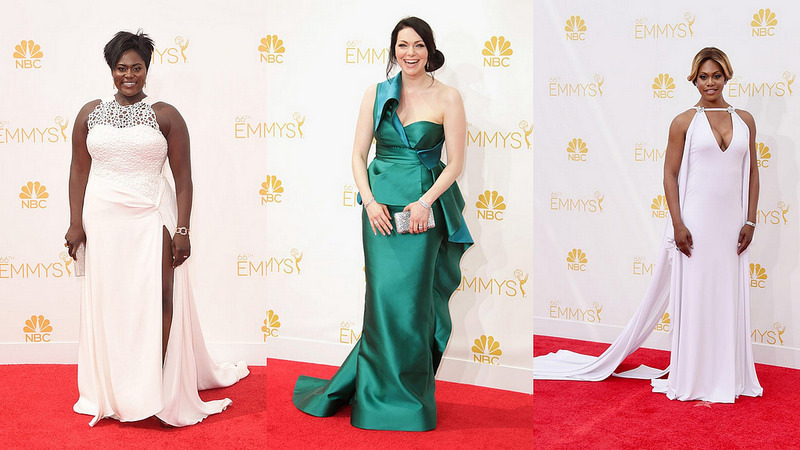 Did you catch the Emmys? Any of the red carpet specials on E!, CW or NBC? Thoughts?